One of the very first things Jesus did on rising from the dead was to give two disciples a Bible study. The effect was to cause their hearts to burn within them when he opened the scriptures to them. We learn from this that the scriptures, the Old Testament or Tanach, as the Jews say, were so important that the risen Christ Himself taught them on the road to Emmaus. The opening of the scriptures was a prelude to the opening of their eyes to recognize Jesus in the breaking of bread. The purpose of studying the scriptures is to recognize Jesus. First came the revelation of Yeshua in the scriptures teaching and then came the revelation of Yeshua in the breaking of the bread. Note how the sharing of the scriptures leads the disciples to issue the invitation to have Jesus commune with them. 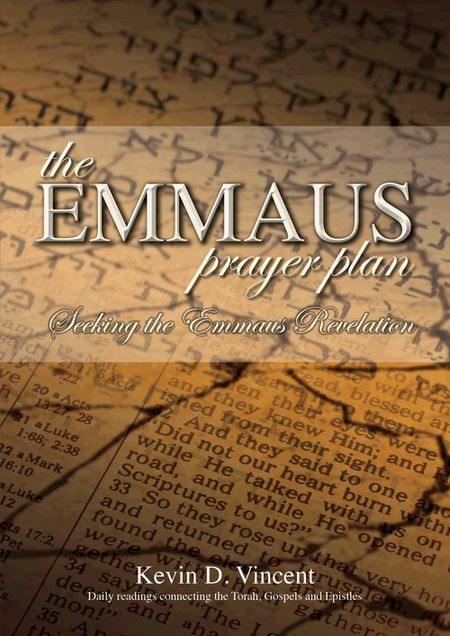 That is surely the purpose of all Scripture reading, including the readings in THE EMMAUS PRAYER PLAN. Kevin D. Vincent, All Rights Reserved. Readers are free to print off individual pages for their own use but not to sell them to others. Artwork for the book cover courtesy of Donna Elliott ©, New Zealand Artist, All Rights Reserved.